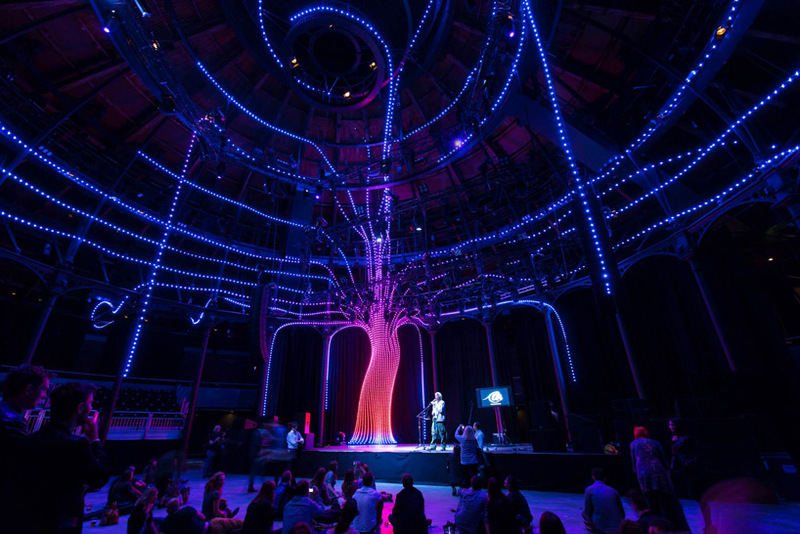 Arboreal Lightning is a large-scale interactive lighting installation by atmos that transforms sound and gesture into an immersive, fluctuating, luminous environment – specifically designed for the Camden Roundhouse. 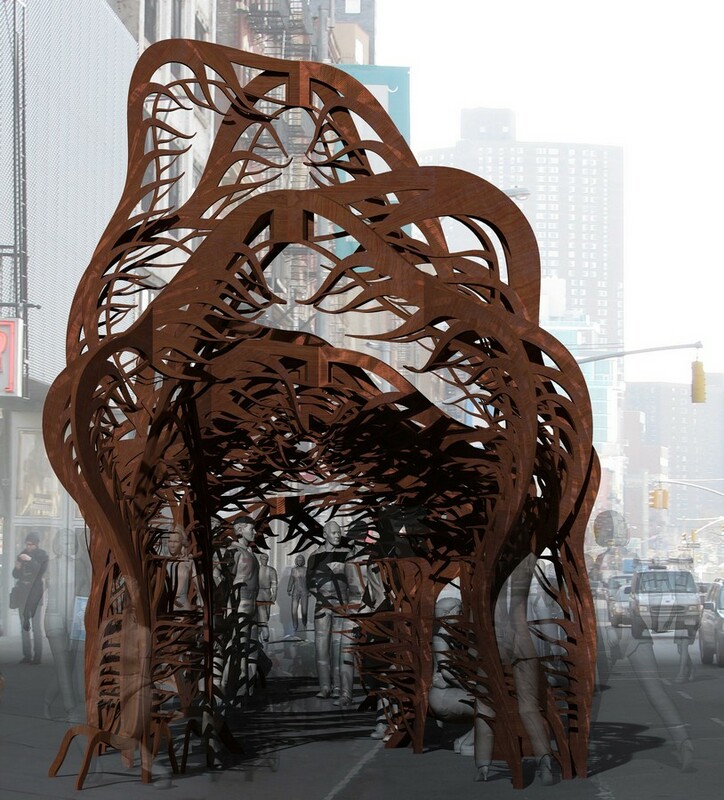 Its activity is generated by both amateurs and professionals – artist performers and a wider audience – creating a performative stage beacon that activates programmed performances, and also serves as an interactive public installation outside concert times. 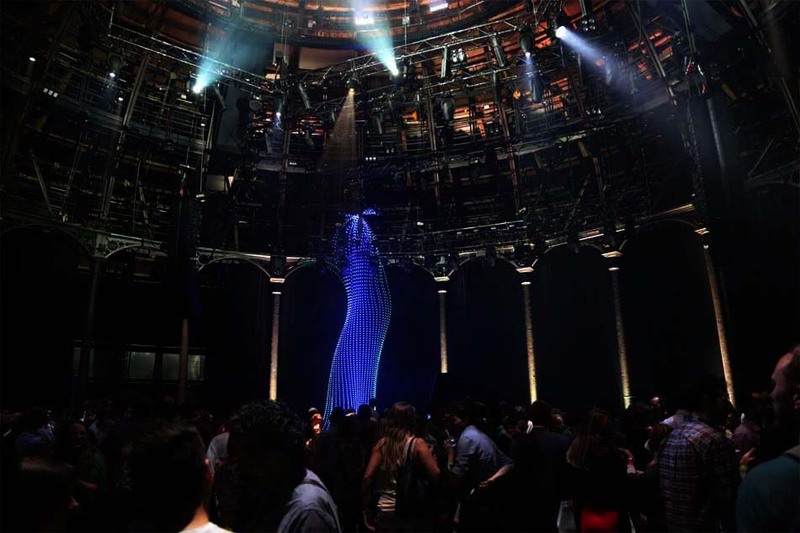 Arboreal Lightning is the centrepiece and graphical icon for the 4-day Reverb Festival of Contemporary Classical Music – a smorgasbord of contemporary composers, with an emphasis on technological innovation. 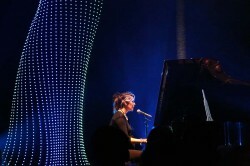 It was commissioned by both the Roundhouse venue and the Reverb curator, acclaimed musician Imogen Heap, who will then modify and use it on her year-long world tour. 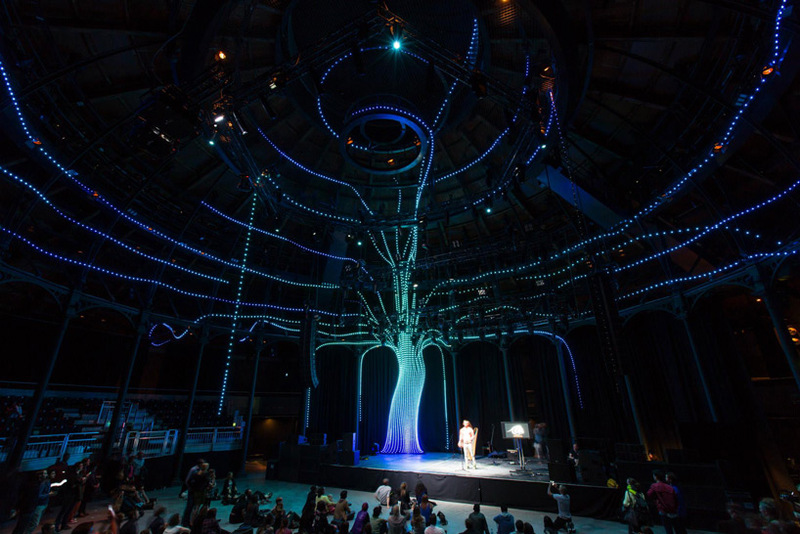 The project mirrors the Roundhouse’s clock-like plan of 24 columns by bundling 24 strands of LED light into a giant heavy-rooted trunk that grows from the stage to arc over the colonnade and arches above. 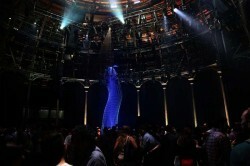 The strands soar upwards and weave through columns and rafters to follow the building’s dramatic structure, seeking hidden recesses and unexplored corners, before exploding outwards above both the performers and audience. 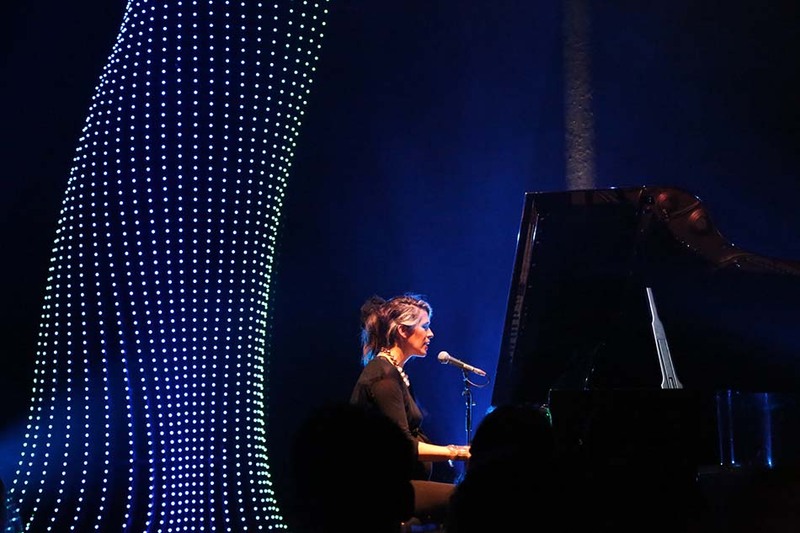 Some branches yearn upwards, towards the light of the lantern; a few strands bow down to reach and mingle with the audience, who can then trigger their own luminous ripples and join in the spatial symphony. 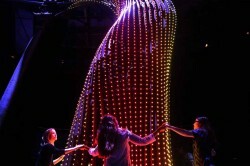 This light canopy of visual music creates a unifying lattice that embraces the people beneath it within a giant, pulsating, Gaian network – umbilical cords connecting people to building, sound to light. 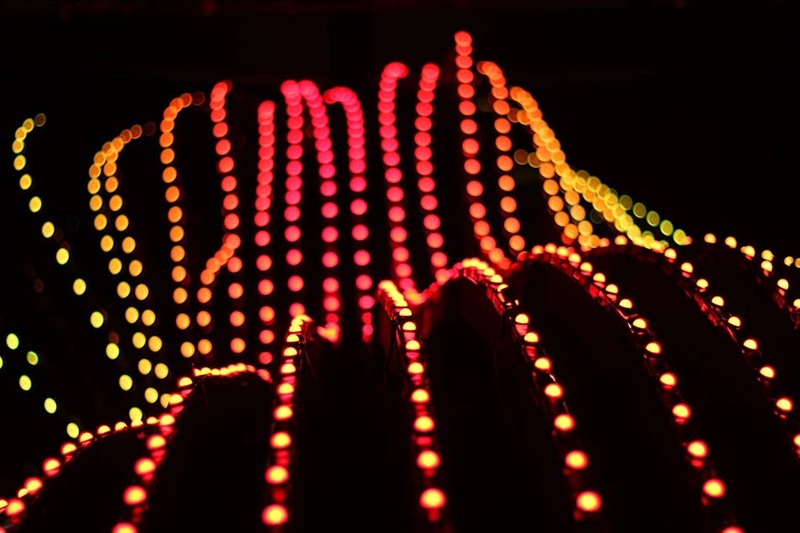 1,500 metres of LED string have been meticulously tamed to shadow the contours of the building’s giant skeleton – yet each of the 4,800 pixel nodes glimmer individually in response to life. 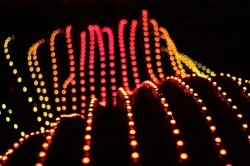 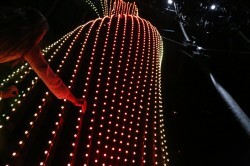 They coalesce to form a sinuous elastic mesh of sculptural video; a fluid, spatial cinema, worming through the building. 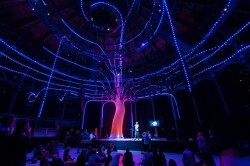 Arboreal Lightning unleashes the hidden power of a place – and people. 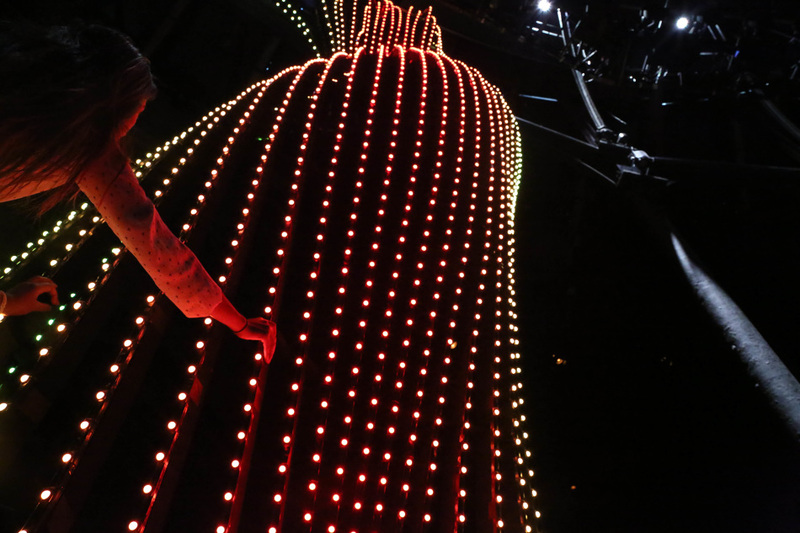 It explores inaccessible spaces and ineffable sensations – the physical manifestation of music, and the convergence of sensations. 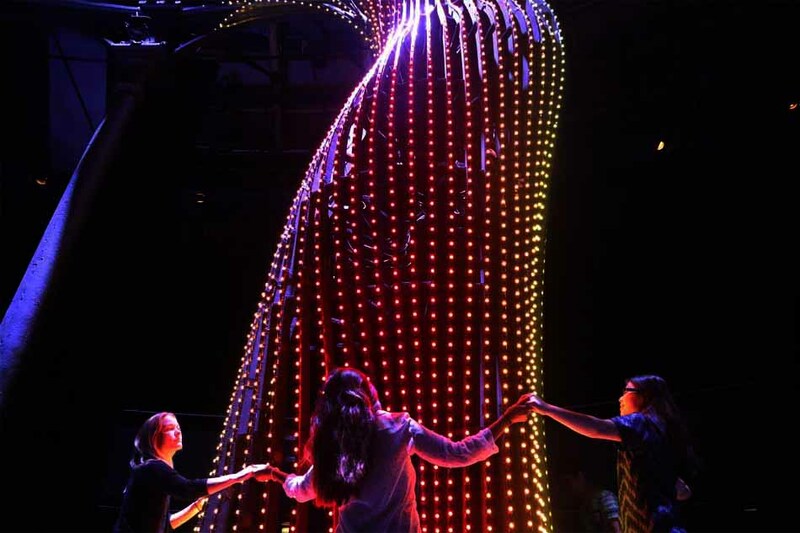 In an age of emancipated connectivity and collaboration, it seeks to reinvent and re-imagine the relationship between performer and audience, sound and light. 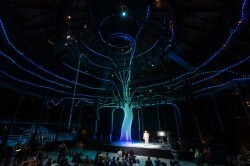 Arboreal Lightning is supported using public funding by the National Lottery through Arts Council England, with additional support from Roundhouse, Imogen Heap and Radius Music.